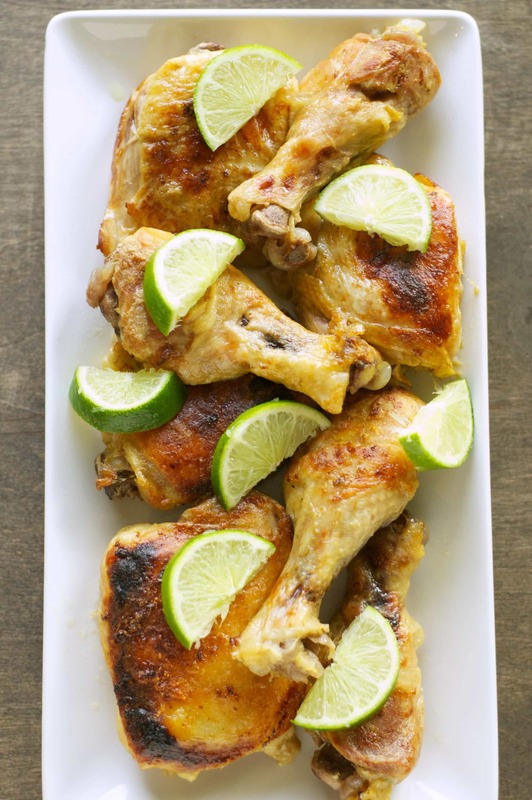 Coconut + Lime = Summer Cocktail Chicken! As weird as it sounds it really works! I’ve seen a few recipes floating around and decided it was time to give it a try. I decided that making it in the slow cooker made a lot more sense and of course I wanted to keep the flavors simple. There is no overwhelming taste of creamy coconut or of the lime here…. 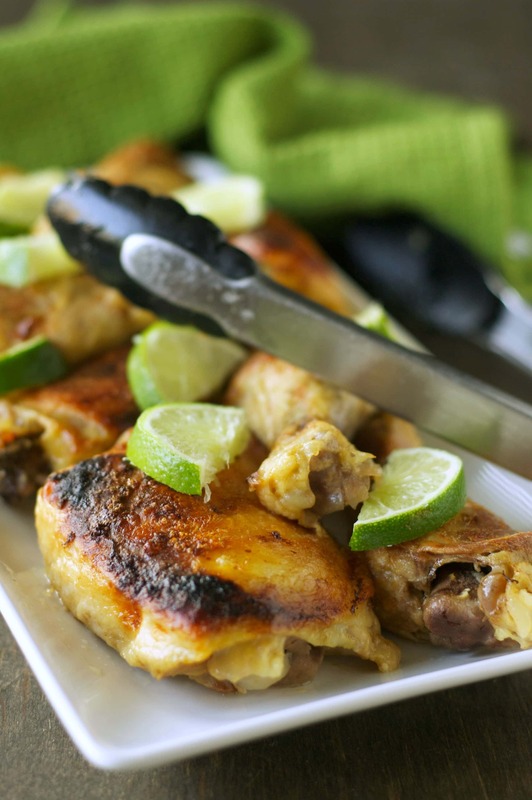 just a hint of flavor and lots and lots of juicy-delicious-fall-off-the-bone chicken. I found 2 pounds of chicken thighs and 1 pound of chicken drumsticks on sale so that’s what I used for four pieces of each. In my mind I thought we would all eat a piece of each… in reality I have a couple pieces left over and plans to shred them for my salad at lunch time today! 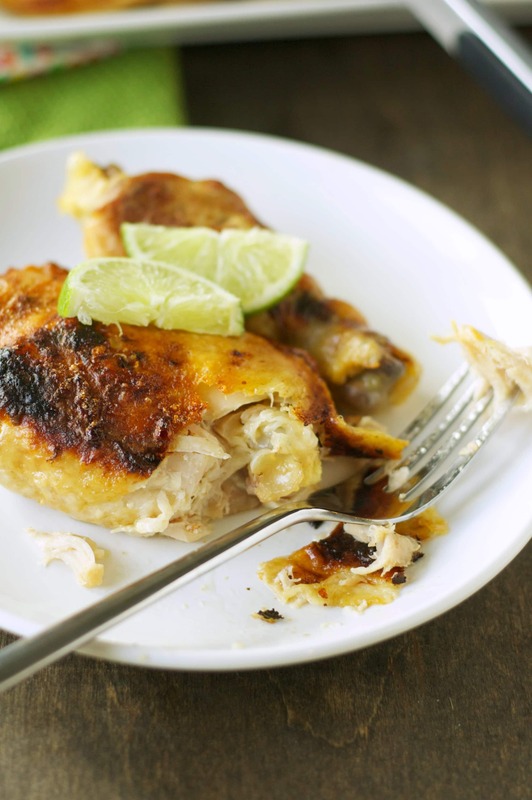 Use any cut up chicken pieces you like… best to use bone-in skin still on pieces. Crack open a can of coconut milk and your sauce is practically done! I added a little pineapple juice along with some lime juice and seasonings. All the tastes of summer. Almost sounds like a great ice cream flavor! I let this cook all day on low and then did a quick broil to crisp it up just a little. You could skip this step if you are in a hurry but if you are serving it for company then it will be worth the extra few minutes. If you line your broiling pan with foil then there’s really no clean up. Optional (but recommended) place cooked chicken on foil lined broiler pan and broil for 3-8 minutes. Keep an eye on it and take it out as soon as it starts to brown up. I made this today, didn’t have pineapple juice but did have some fresh pineapple. I used a couple slices and the leftover juice, and added a little extra lime juice. Based on some of the comments, since I was using this as the main flavor, I added some more of the listed spices and some cayenne. Took the sauce out of the crock, added fresh parsley and reduced it down to serve with basmati rice-side of some pan roasted zuchinni and yellow squash. So delicious, loved the combination of flavors! Will be making again for sure! I’m so glad you enjoyed it and put your own “spin” on it! This was absolutely terrible. Followed the recipe exactly, even broiled. Lots leftover which will go in trash. Hi Melissa. I’m sorry to hear you were disappointed. Can you tell me what you didn’t like about it? Was it just not to your taste or did you feel there is an error in the recipe? I’d love to help you troubleshoot! My mother-in-law and I made this tonight and it was really good but definitely needed some more flavor. We ended up needing to thicken the sauce slightly with cornstarch on the stove while the chicken was broiling. Then after thickening it while it was still on the stove we added 1/8 tsp more of all the spices. Then we added some lime zest and pineapple tidbits into the sauce. We served it with fresh cilantro on top and that topped the flavors off perfectly. Overall a great recipe, I just liked adding some more flavor to it. Thanks! Hi Lindsey! That sounds amazing! I’m so glad you were able to customize it to your liking! Hi Jennifer! This is only the second time I’m using my new crockpot. My husband bought chicken thighs and drumsticks yesterday, probably thinking he’s coming home from work to some juicy GRILLED drumsticks. Sorry, honey, change of plans. Lol! This was so easy! Took me about 10 min. to put together (I had everything except pineapple juice, but I had a whole one, I threw some in the blender with coconut water.) I will also do the broiler and reduce the sauce on the stove. I will let you know…. Love it!! Be sure to let me know how it turns out!! I have this pinned to make next week and I can’t wait to try it! Just a quick question: how do you feel about waiting to add the spices until the end of the cooking time? I’ve found a lot of slow cooker recipes I make are much too bland unless I add the spices about 20-30 minutes before it’s done. It’s almost like the flavor cooks right out! Be warned, as I mentioned in some of the text and in case you didn’t catch it, this one is not super flavorful. More just a nice juicy chicken to go with other sides. So if you want more from it I would up the spices and add some more. You could do a little while cooking and then add some more when done. Or…. 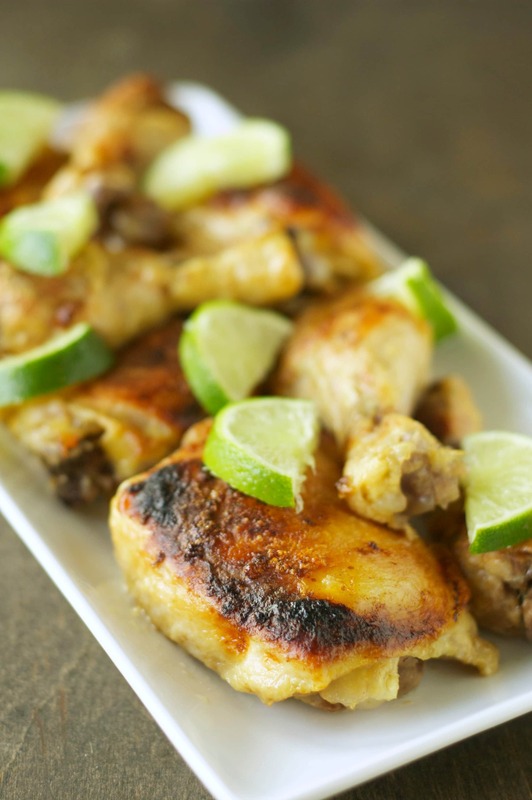 check out this Spicy Lime Chicken for something with a little more kick. Sorry Jennifer but this is a throw-away recipe. Followed the recipe exactly except for not leaving the skin on. No flavor…no skin? Cooked 6 hours on low. Hi Carlene. Ahh, so disappointing! Sorry it didn’t work out for you. 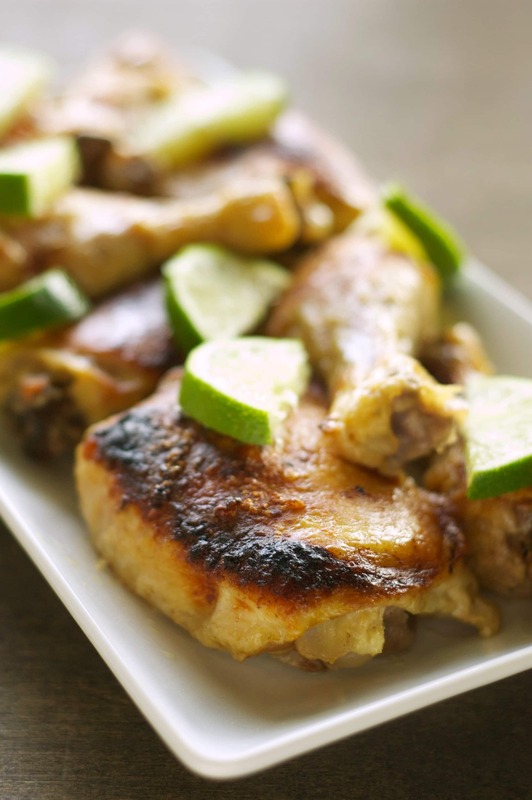 As noted this is definitely a recipe that requires leaving the skin on bone-in chicken and is more of a recipe for a super juicy chicken that goes very well with other flavors and doesn’t pack a big flavor punch itself. 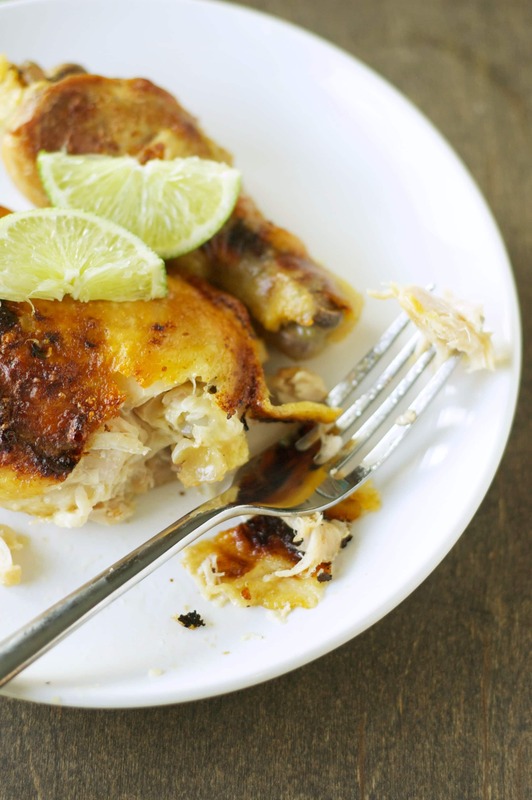 How about this Slow Cooker Honey Jack Jalapeño Chicken? It’s packed with flavor and just a bit of spice and sounds more like what you are looking for!! One question, do you eat the sauce that the chicken is cooked in? Some crockpot recipes says not to and others say to pour it over cooked chicken at the end and eat. Making this for dinner tonight, looks delish. I probably won’t drizzle the sauce on top this time just to be safe. My understanding is the sauce is safe to eat as everything is heated to the same temperature and I often eat chili and soup that has the meat cooked in it as well. You can also pour the juice into a saucepan and bring it to a boil for a few minutes as well to thicken and make it into a gravy and that may make you feel more comfortable with it as well. Hope that helps! Lift chicken out and add rice to pot, put chicken back on top and cook another hour. Meal is complete with a salad. Thanks Laurette! That is such a brilliant suggestion!! Yummmm! This looks so good! I never use my broiler to crisp things up that I cook in the crock pot, that is such a good idea! Trying this one for sure! I try not to add extra steps to slow cooking but if you line the pan with foil then there is really no clean up and it only takes a few minutes! Totally worth it!